JUNE 21, 2019 on the Campus of Marshall University! Cost: Early Bird Registration (Until Friday, June 7th) is $25 per registrant and includes a race T-Shirt. The registration fee is $30 between June 8th – June 21st. Registration will be available the day of the race for $35. T-Shirt is only guaranteed to participants who register by June 7th. 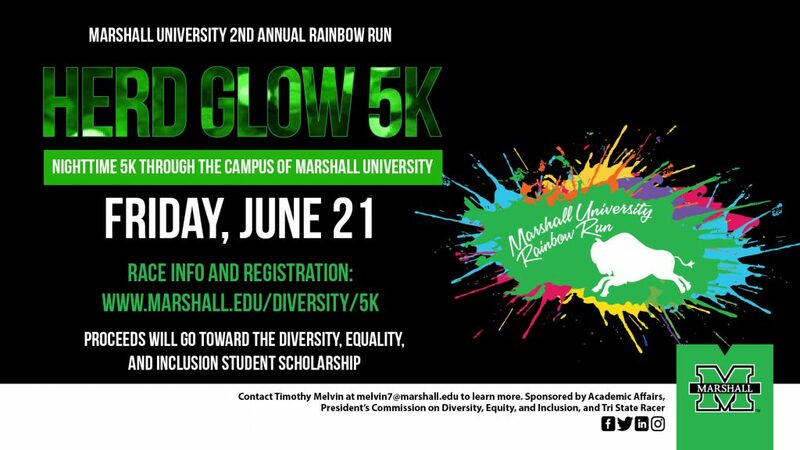 The Marshall University Rainbow Run raises funds for the Marshall University Diversity, Equality, and Inclusion Student Scholarship for undergraduate students who have demonstrated contributions to diversity, equality, or inclusion initiatives in the area(s) of racial or ethnic diversity, sexual orientation or gender identity, disability, veteran status, and/or other areas underrepresented or otherwise important to diversity, equality, and inclusion. The student scholarship will be endowed once $15,000 is raised. Please click here to learn more about the student scholarship!